If you are experiencing pain in the ball of your foot, at the base of your second and third toes, you may have developed metatarsalgia. This is pain in the metatarsal bones of the foot. Interestingly, this is not a condition in its own right. Rather, it is a symptom of other foot problems. In this article, we will discuss metatarsalgia and provide good advice to help you deal with it. Read on to learn more. How Do You Know You Have Metatarsalgia? Incorrect diagnosis is quite common with metatarsalgia. For example, many people confuse this condition with one that is quite similar, Morton’s Neuroma. This is inflammation of the nerves in the area of the metatarsals. It actually causes metatarsalgia. 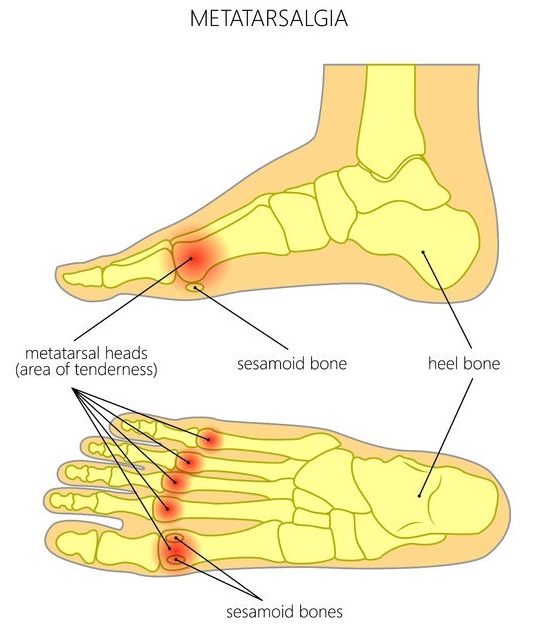 If you feel pain at the base of your second and third toes, suspect metatarsalgia. Many people say that, at first, they believe they have a wrinkled sock or a rock in their shoe. Some people say the pain is an ache that gets worse when they stand or walk (especially on very hard surfaces). Some feel a sharp pain, and some feel a burning sensation in the toes. This pain occurs because the fatty tissue that is meant to absorb shock to the forefoot may have shifted so that it no longer protects the bones that bear weight in the ball of the foot. This causes more trauma to the bones and may cause calluses to build up to protect the bones. If excessive loading of the affected area continues, the problem will only worsen and will eventually become a chronic injury. This can lead to complications such as swollen joints, toes that are not able to bend and protruding knuckles on the tops of the toes. If left untreated, metatarsalgia can cause toes to “claw”. The development of these complications can cause a misdiagnosis in that the metatarsalgia is overlooked. It’s a good idea for your diagnostician to get an ink imprint of the sole of your foot as this can literally give a clear picture of the distribution of weight across the sole of your foot. Dark imprints at the second and third metatarsal bones indicate excessive weight bearing in that area. Metatarsalgia Diagnosis & Treatment Guide! Physical oddities of the feet can cause metatarsalgia. For example if either the second or the third metatarsal is very long in comparison to the fourth metatarsal, you may be predisposed to this condition. Sometimes the metatarsophalangeal (MTP) joints may be dislocated or just partly out of joint. All of these conditions can cause you to put too much weight on your forefoot. This leads to wear and tear and pain in the ball of the foot. Luckily, this painful symptom can usually be treated successfully without resorting to surgery. 1. Give your forefoot a break. Take it easy and change your footwear and/or orthotics so that you are not putting so much stress on that area. 2. Get a good diagnosis that identifies the underlying cause of your pain. 3. Address that condition appropriately. How Do You Treat Metatarsalgia In The Long Term? Non-steroidal anti-inflammatory drugs (NSAIDS)may help if you have moderate to severe symptoms as they can just take the edge off the pain. Combining NSAIDs with rest and appropriate strengthening activities is a good, non-operative healing strategy. Comfortable shoes or “comfort shoes” usually have a stiff sole and a contoured rocker bottom that helps shift weight bearing away from the front of the foot. Luckily, lots of stylish athletic shoes for both men and women possess these very qualities. Metatarsal pads that are fitted correctly can help protect the sore area and disperse weight away from the ball of the foot and the metatarsal heads. Soft orthotics can help accommodate the injured area and cushion against excessive force. This facilitates healing and prevents re injury. Using these orthotics may help the plantar fat pad shift back into place beneath the metatarsal head. Hammertoe crest pads can be very helpful if you have developed a claw toe. Soft, gel crest pads help support the toes and bring the bent toe back into alignment. Some people like to tape the toes to improve their positioning. Regular foot exercises and changes in your activities can also help. Foot exercises can strengthen the small, intrinsic muscles of the foot. Adding exercises to strengthen and stretch your calves helps reduce pain. Modifying your activities can give your feet the rest they need. If you have been walking or running a lot, take a break. When your feet hurt, rest them. Put them up with an ice pack or soak them in a foot bath. Foot massage is always a good idea! If you give these non-intrusive methods a good try without success, your doctor may recommend a corticosteroid injection. As a one-time, stop-gap measure, this is a good way to get immediate relief from pain, but don’t become dependent on it. If you use this method habitually, it can lead to a breakdown of the ligaments and will worsen toe deformity. Every once in a while, non-surgical methods simply do not work to resolve this problem. When this happens, your doctor may recommend one of several procedures that are commonly performed to deal with metatarsalgia. Symptoms of the problem, such as claw toe, may also be simultaneously surgically addressed. When toe deformities are taken care of, the plantar fat pad can also be shifted so that it once again protects the metatarsal heads. If the MTP joint at the base of the affected toe is inflamed and swollen, your surgeon may decide to perform a synovectomy (removal of the synovial lining). If your problem is caused by excessively long metatarsal heads, your surgeon may decide to shorten one or both of them using a procedure called Well osteotomy. Shortening these bones can change the loading characteristics of metatarsal heads to provide relief to the forefoot. If calf muscles have not responded to stretching and strengthening exercises, your surgeon may perform a “Strayer procedure” to provide more flexibility to this muscle through surgery. Are There Any Complications With These Surgical Procedures? Very rarely, people undergoing surgical procedures experience more serious complications, such as deep vein thrombosis and pulmonary embolism. 1. Arterial damage can cause a loss of the blood supply to the tip of the affected toe. This can cause the tissue to die and may necessitate amputation of the tip of the toe. In rare cases, the entire toe must be amputated. 2. Stiff toes are sometimes the result of surgery. After a surgical procedure, loss of flexibility is common. This can be uncomfortable but is not usually a major problem. As with recovery from most surgical procedures, light exercise can help you recover full use of the affected area. 3. No cessation of symptoms: Occasionally, symptoms continue to some degree despite having been addressed surgically. This is most likely when the condition is long-standing, has become chronic and quite a bit of tissue damage has been done. 4. Transfer metatarsalgia occurs when the correction of the second and third metatarsals causes a shift in weight bearing to the remaining metatarsal joints. This can cause you to experience these same symptoms over again in the neighboring toes. 5. Numb toes: Sometimes the nerves supplying sensation to the affected toe are damaged during surgery. This can cause a loss of sensation in all or part of the affected toe. 6. Recurrence of toe deformity can happen. Sometimes the fix just doesn’t take, and over time the toes drift back into their former deformed configuration. 7. Worsening of symptoms: In some rare cases, surgery makes the condition worse rather than better. The best way to deal with metatarsalgia is to avoid having it develop in the first place. It’s important to maintain a healthy weight to avoid putting excessive stress on your feet. Follow a regular schedule of light-to-moderate exercise to ensure better circulation throughout your body. Avoid high heels and shoes with narrow or pointy toes. Wear good quality shoes that are correctly fitted. They should have a roomy toe box and provide proper cushioning, arch support and alignment for your feet. Non-slip soles help you avoid all manner of foot injuries. Don’t underestimate the value of good socks. Invest in padded socks that will stay in place and provide extra protection and cushioning for the metatarsal bones. Use over the counter shoe inserts as needed for comfort.